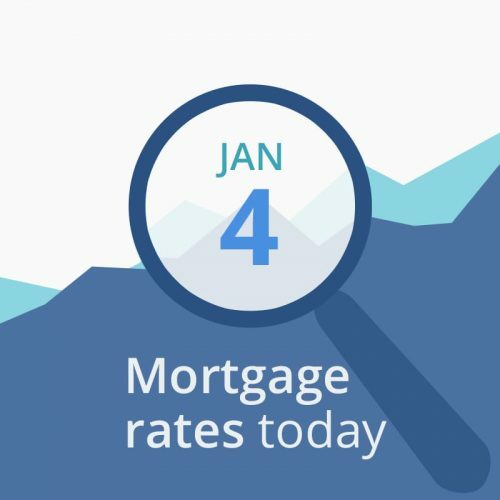 Average mortgage rates today dropped again! As yesterday’s report here predicted. The most important report we receive each month (for mortgage rates, anyway), came in with very strange results, and I did say that it could change things in a big way. First (for mortgages), the bad news. U.S. employers cranked up hiring in December, adding 312,000 jobs — when analysts had predicted just 182,00 jobs. This in spite of a trade war, global economic slowing, and a continued government shutdown. However, the unemployment rate increased to 3.9 percent, which experts did not see coming. And investors continue to worry as companies like Apple are projecting lower sales. If the trade war and shutdown continue, consumer purchases, factory orders and jobs could all take a beating. Most of this morning’s data doesn’t look good for short-term rate changes. If you can lock in something good now, consider grabbing it. Today’s mortgage rates are very nice if you want to lock in. And today’s early financial data point to rising rates — unless stocks do a 180 and plunge again. We may see repricing for worse — stay in contact with your lender. If closing soon and you see a good deal, grab it.